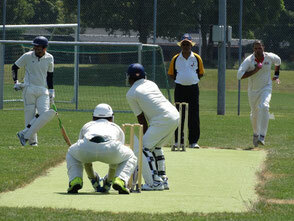 Despite an unbeaten 133 by Rahul Khadewal, Winterthur lost their third consecutive CSPL match, this time against away to local rivals Power CC, by 2 wickets, leaving the club second from bottom of the CSPL Eastern Division. In reply to Winterthur's 260-6 off their 40 overs, Power, were on the ropes at 96-6 but the tail end wagged like a puppy, taking them to 149-6, 177-7 and 200-8 before Asad (93*) powered his way to victory scoring 9 sixes and 5 fours to take the home team on to win by 2 wickets with one over to spare. WCC captain Tom Mampilly won the toss and decided to bat on a hot and sunny afternoon. The Winterthur innings started well enough, Jagath (41) batting well supported at the other end by Vageesh (4), scoring at 5 an over. However, Vageesh caught by the keeper in the 6th over appeared to inspire Power. Four overs later Prafull (4) was to follow and when Pip (1) went just 12 balls later, Winterthur looked to be struggling at 56-3, despite all the signs that the pitch and the outfield should suit the batsman. WCC captain, Tom mampilly (39) steadied the Winterthur innings, batting with Rahul (133*) who went on to finish the innings unbeaten, also support by Mohammed (4) and Selva (16*). 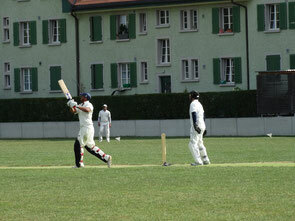 The Winterthur innings closed on 266-6 having used up all thier 40 overs. The Power innings began with a buoyant Winterthur side, determined to defend the total. but WCC had to wait until the 12th before Rogan took the second of the Power openers, Hassan (14), to leave Power 32-2 off 12, trailing on the run-rate. Six balls on, Rogan struck again dismissing Sajid (33) caught well by Rod at mid-on. Matters did not improve for Power when Ash (9) was caught again by Rod, same shot, same position, but this time off Pip's bowling. At 96-6 Winterthur were in a commanding position and it was their game to lose. And lose they did. A very good innings by the Swiss national captain, Afzaal (52), helped Power recover to 149-6, when Asad (96*) came to the crease, still 120 runs short of the total. Although dropped on 50, Asad played a superbly mature & patient innings. He took full advantage of some inexperienced Winterthur bowling, waiting for the inevitable short ball off each over. It might be added, Asad was also well supported at the other end by Rana (9), Amir (12) and Mubarik (8*), who delivered him the strike at the end of each over, taking Power to 266-8 with 6 balls to spare and defy Winterthur their first CSPL win of the season. 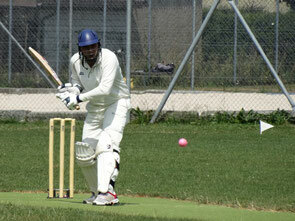 View photographs from the CSPL Power versus Winterthur match played on Sunday 12th July.